Agitation and violent behavior are frequently seen in acute care settings, such as emergency departments and inpatient psychiatric facilities. [5, 6, 7] Approximately 10% of psychiatric patients in the emergency department will have violent behavior and possibly require some form of restraint. Studies show that nurses and mental health workers are at an increased risk of work-related violence. [9, 10] Psychiatry residents have a 40–50% chance of being physically assaulted by a patient during their residency,  and emergency physicians also have an increased risk of being physically assaulted by a patient at some point during their practice. Physical restraints are therefore a necessary safety measure in certain circumstances. Professionals must be aware of the potential negative physical and psychological consequences of restraints. Measures should be taken to preserve the patient’s dignity and rights. The act of physically restraining a patient has both ethical and medicolegal implications, including the potential violation of a patient’s rights. One study that compares legal and medical opinions suggests that emergency physicians are inclined to use restraints more frequenctly than juris doctors given the same scenario. Therefore, the use of four-point restraints should be a last resort after attempts to deescalate the situation have failed and less restrictive measures were ineffective. The decision to physically restrain a patient must be given serious consideration. For the patient's own protection and the protection of others, a health care professional may deem it necessary to place a patient in four-point restraints. The Centers for Medicare & Medicaid Services established some basic principles for the use of restraints (see C.F.R. 482.13). Note that leather restraints are typically reserved for combative and violent patients. 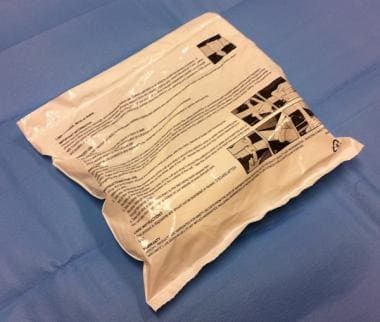 While anesthetics are generally not necessary, chemical restraints may be used in conjunction with physical restraints or as an alternative to physical restraints. Haloperidol, lorazepam, and ziprasidone are examples of medications commonly used in the setting of acute agitation. Some patients may become more violent and agitated after physical restraints are applied, so the use of these medications in conjunction with physical restraints may be necessary to achieve safe control of the situation. Additionally, the use of haloperidol may be combined with an anticholinergic such as benztropine to reduce the possibility of extrapyramidal effects. Positioning the patient in the supine position is the preferred option. The head of the bed should be elevated approximately 30 degrees to decrease the risk of aspiration. See the image below. Patient positioning for four-point restraint. Positioning the patient in the prone position increases the risk of suffocation and should only be used as a secondary option. Do not use any pillows under the patient's head in this position. The complication rate associated with use of physical restraints is 6.7%. Half of the complications are associated with escape from restraints. Therefore, it should be ensured that the restraints are applied securely and as specified by their manufacturer. The most commonly cited complications are abrasions and bruises. Injuries to the patient's extremities may include dislocation, contusion, numbness, tingling, fracture, or muscle strain. These injuries tend to occur during the application of restraints with a violent patient. Positioning the patient prone increases the risk of suffocation. This is further increased if the patient is positioned prone with a pillow. This position should be avoided if possible. Positioning the patient supine without elevating the head of bed increases the risk of aspiration and subsequent respiratory problems that may develop. If a patient is not chemically sedated while physically restrained, prolonged struggling may lead to hyperthermia, lactic acidosis, and elevated creatinine kinase levels. Laboratory studies should be obtained if this is suspected, as it may change a patient's disposition from psychiatric service to medical admission. Proper technique starts with having a sufficient number of personnel. Ideally, there should be a five-member team, with one leader and one member for each extremity. Hospital security and police should be called to help subdue a violent patient. Violent patients should be isolated, derobed, searched for weapons, and gowned. This can prevent harm to hospital staff members who are not adequately trained. Any staff members attempting to physically restrain a patient should be educated and equipped with skills to protect themselves and minimize harm to the patient. Clearly explain to the patient and the patient's family what you are doing as the restraints are being applied and explain why you are applying the restraints. 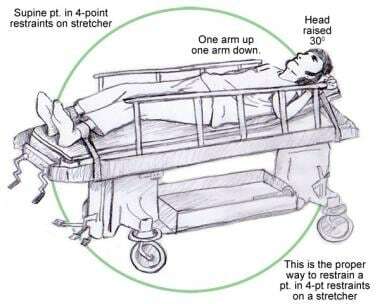 Have each member apply a restraint to an extremity as specified by the manufacturer instructions, and then secure the restraint to the base of the bed or stretcher. Do not apply the restraints to bed rails. Restraints may need to be applied one at a time while the other extremities are held down. 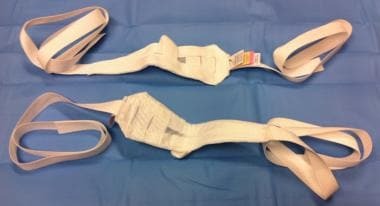 Providers should be aware of how to apply the specific types of restraints used by their hospital and also be familiar with how to tie quick-release knots. After the restraints are secured, their integrity should be tested and the patient's extremities should be examined for any signs of circulatory compromise. Offer the patient medication, but if necessary administer medication or chemical restraints involuntarily. The patient should be continually assessed, monitored, and reevaluated. The frequency and types of reassessments vary among institutions. It is the duty of the health care professional to discontinue the use of four-point restraints as soon as possible once it is deemed safe to do so. If the decision is made to remove the restraints, remove one at a time while carefully monitoring the patient to ensure safety. The following is a list of rules for restraint and seclusion set forth by the Centers for Medicare & Medicaid Services as part of the Condition for Participation for Hospitals (see C.F.R. 482.13). This list provides a summary of points to remember when the use of restraints is being considered. Restraint and seclusion may be ordered only by a physician or a licensed independent practitioner (eg, a physician’s assistant or nurse practitioner who is licensed to deliver medical services without oversight). The intervention must be ended as soon as it is safe to do so. Certain risky practices, such as “basket holds” and applying back pressure to a person who is prone, are prohibited. A physician or licensed independent practitioner must conduct a face-to-face assessment of the individual as soon as possible, which cannot exceed one hour after restraint. Debriefings with the individual and staff must occur as soon as possible after each use of restraint or seclusion. Staff must receive extensive and appropriate training, including all aspects of deescalation. Deaths and serious injuries resulting from restraint or seclusion must be reported to governmental authorities. American College of Emergency Physicians: Clinical policy: critical issues in the diagnosis and management of the adult psychiatric patient. Ann Emerg Med. 2005. 47:79. [Full Text]. Espinosa L, Harris B, Frank J, Armstrong-Muth J, Brous E, Moran J, et al. Milieu Improvement in Psychiatry Using Evidence-Based Practices: The Long and Winding Road of Culture Change. Arch Psychiatr Nurs. 2015 Aug. 29 (4):202-7. [Medline]. Spinzy Y, Maree S, Segev A, Cohen-Rappaport G. Listening to the Patient Perspective: Psychiatric Inpatients' Attitudes Towards Physical Restraint. Psychiatr Q. 2018 Feb 14. [Medline]. Gates DM, Ross CS, McQueen L. Violence against emergency department workers. J Emerg Med. 2006 Oct. 31(3):331-7. [Medline]. James A, Madeley R, Dove A. Violence and aggression in the emergency department. Emerg Med J. 2006 Jun. 23(6):431-4. [Medline]. Kowalenko T, Walters BL, Khare RK, Compton S. Workplace violence: a survey of emergency physicians in the state of Michigan. Ann Emerg Med. 2005 Aug. 46(2):142-7. [Medline]. Tardiff K. The current state of psychiatry in the treatment of violent patients. Arch Gen Psychiatry. 1992 Jun. 49(6):493-9. [Medline]. Presley D, Robinson G. Violence in the emergency department: nurses contend with prevention in the healthcare arena. Nurs Clin North Am. 2002 Mar. 37(1):161-9, viii-ix. [Medline]. Möhler R, Meyer G. Attitudes of nurses towards the use of physical restraints in geriatric care: a systematic review of qualitative and quantitative studies. Int J Nurs Stud. 2014 Feb. 51 (2):274-88. [Medline]. Schwartz TL, Park TL. Assaults by patients on psychiatric residents: a survey and training recommendations. Psychiatr Serv. 1999 Mar. 50(3):381-3. [Medline]. Black KJ, Compton WM, Wetzel M, Minchin S, Farber NB, Rastogi-Cruz D. Assaults by patients on psychiatric residents at three training sites. Hosp Community Psychiatry. 1994 Jul. 45(7):706-10. [Medline]. Goulet MH, Larue C. Post-Seclusion and/or Restraint Review in Psychiatry: A Scoping Review. Arch Psychiatr Nurs. 2016 Feb. 30 (1):120-8. [Medline]. [Full Text]. Macias D, Weiss S, Ernst A, Ann Maggiore W, Nick T, Sklar D. Comparison of emergency physicians' and juris doctors' opinions on emergency department patient restraints usage. South Med J. 2010 Jul. 103(7):623-9. [Medline]. Petit JR. Management of the acutely violent patient. Psychiatr Clin North Am. 2005 Sep. 28(3):701-11, 710. [Medline]. Glezer A, Brendel RW. Beyond emergencies: the use of physical restraints in medical and psychiatric settings. Harv Rev Psychiatry. 2010 Nov-Dec. 18(6):353-8. [Medline]. Annas GJ. The last resort--the use of physical restraints in medical emergencies. N Engl J Med. 1999 Oct 28. 341(18):1408-12. [Medline]. Rose D, Perry E, Rae S, Good N. Service user perspectives on coercion and restraint in mental health. BJPsych Int. 2017 Aug. 14 (3):59-61. [Medline]. [Full Text]. Zun LS. A prospective study of the complication rate of use of patient restraint in the emergency department. J Emerg Med. 2003 Feb. 24(2):119-24. [Medline]. Coburn VA, Mycyk MB. Physical and chemical restraints. Emerg Med Clin North Am. 2009 Nov. 27(4):655-67, ix. [Medline].